There is a murder every 2.5 days in Washington state. 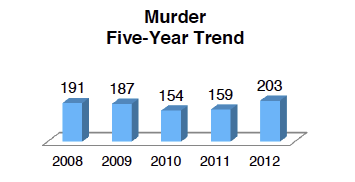 And the number of people murdered has gone up from 159 in 2011 to 203 in 2012 (That’s a 27 percent increase). Crime occurred most frequently in the state in September; it occurred the least in February. Property crimes: $205,931,711 in property was stolen in 2012; of that, law enforcement recovered $16,931,651. Though it is now legal for an adult 21 and older in Washington state to possess up to an ounce of pot, police in Washington seized 762,809 grams of pot in 2012. By comparison, the two next highest drugs seized were meth (25,418 grams) and heroin (24,824). Arrests: 155,916 people were arrested in Washington in 2012. Of those, 30,924 were between 20 and 24 years old, making it the age group with the greatest quantity of arrests. Of all those arrests, almost a fifth — 18.5 percent — were for DUI. To read the full report for yourself, click here. I’ll be dissecting our local numbers for a story at kitsapsun.com in the days ahead. Heroin vapor: A Seattle man was arrested in Suquamish for a drug possession warrant Oct. 8, according to Kitsap County Sheriff’s Office reports. Deputies searched him, they found a eye drop-like bottle filled with a brown liquid. The man admitted it was heroin and that he “inhales the liquid as a nasal spray” — a method of ingestion the cop hadn’t seen before. The man said he’d gotten hooked on opiates after an appendix surgery. Stolen mail: A witness to a car sifting through mailboxes on Sandy Hook Road NE and Dock Street NE called 911, according to sheriff’s reports. A Suquamish officer in the area stopped the suspected car and the two people inside were interviewed. A bag of mail belonging to addresses in Silverdale, Poulsbo, and along Sandy Hook Road was spotted in the car. Both suspects have been charged by prosecutors with theft. Guns-in-bars advocate arrested for DUI: A Tennessee lawmaker who spearheaded a law that allows the state’s citizens to carry guns in bars was arrested for DUI this week, reports the Commercial Appeal. In Washington state, it appears guns are banned in areas limited to those 21 and over. Deputies catch another scrap metal thief: On Tuesday, Kitsap County Sheriff’s deputies were called to an Olalla Valley Road address for a possible break-in to a for-sale home. When they got there, two deputies heard “ripping” sounds and when they announced their presence, it stopped. A man jumped off a roof and one of the deputies tackled him. The Olalla man, who deputies confirmed had been selling scrap metal, was tearing off sheetrock in the home to get at flexible conduit in the walls, deputies believe. He was taken to the Kitsap County jail for burglary. The theft of metal rages on. If you were against the prospect of a methadone clinic in Bremerton, you’ll likely be incensed by a rather radical approach to drug addiction in British Columbia. At Insite, a clinic in Vancouver’s lower eastside, drug addicts are able to bring in and inject illegal drugs under the supervision of a nurse. The argument for the clinic is that even if they’re choosing to abuse drugs like heroin, the chance they’ll overdose or hurt themselves while in the presence of medical professionals is far less. A study released recently confirms that point. As you may recall, a Seattle non-profit led an effort recently to place a methadone clinic in Bremerton to combat the region’s rising opiate addiction epidemic. But businesses and residents in the area, fearing problems it might bring to the Charlston neighborhood, pushed back and the non-profit abandoned its plans. What that non-profit does is far different from a free injection site. Methadone, a long-acting opiate, is used as a replacement drug for opiate addicts. It can be effective at quelling the addiction without giving the patient a high. That said, how do you feel about the idea of so-called “safe injection sites?” Are those Canadians on to something, or are they off their rockers? Is meth on its way out? Methamphetamine, that crystalline psycho-stimulant that’s been plaguing our communities for years now, appears to be on the decline around the nation, according to results of a survey released by the federal Substance Abuse and Mental Health Services Administration (SAMHSA). So could this be the beginning of the end for methamphetamine? In our area, I’m not seeing any slowdown in police reports from around the county. But we have certainly seen heroin rear its ugly head in the past couple years. And, as you can see from this one sentence I’ve posted from a real police report, it appears, at least anecdotally, that at least one drug seller was having a tough time pushing meth. I’ve spoken to Bremerton Police Special Operations Group Sgt. Randy Plumb about that very sentence, and he told me not to give it much credence. There’s still plenty of demand out there. As the report shows, it certainly isn’t the end for marijuana use, which is ingested regularly by almost 7 percent of Americans, up from 6 percent in 2007. But newer laws and education efforts appear to be working in the fight against meth. increasing methamphetamine availability,” it says. Apparently, the federal government’s public health arm and its law enforcement arm appear to be contradicting each other a bit. In June, I had the chance to attend a conference in Seattle of some of the smartest minds in America when it comes to monitoring drug abuse. 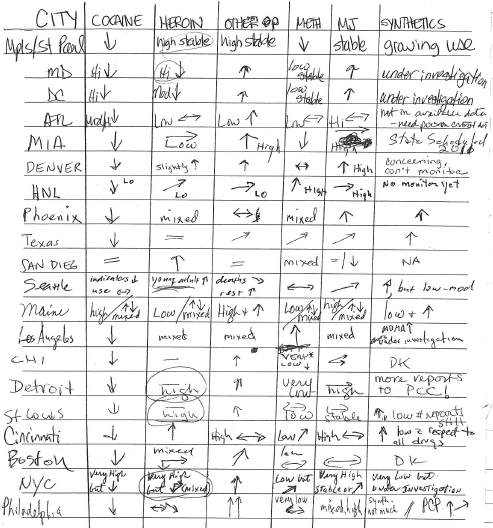 While each gave a presentation about cities and areas across the nation, I found particularly interesting just one sheet of paper that they passed around. Across the top of the page, various drugs — cocaine, heroin, other opiates, meth, marijuana and synthetics — were listed. In each column below, each expert from the cities and areas listed the current trends — up, down, or otherwise — for each drug. Please take a look at the page. But I’ll also provide a short synopsis of my own interpretation of it, as discussed at the Community Epidemiology Work Group in Seattle June 8-10. Cocaine: Clearly down across the country. Its high price, even during the recession, has made it rather cost prohibitive for users, various epidemiologists pointed out at the meeting. There were a few exceptions: New York City and “vacationland” Maine, two of the richest areas of the country. Heroin: Results were mixed but some areas have experienced a surge, including our own, which is denoted with “young adult,” being part of the trend. Readers of our paper will no doubt already know that heroin has experienced a huge resurgence here. Other opiates: Wow. The country is clearly grappling with prescription pill addiction. Meth: This one may surprise you. Though so much attention is given to this particularly dirty drug, most areas reported its use is stable or decreasing. So-called “precursor” laws have obviously had an impact in keeping meth’s key ingredient, pseudoephedrine, out of the hands that would cook it themselves. But more complex drug enterprises appear to have made up for that lack of mom-and-pop meth shops. Marijuana: The results from the group were pretty clear. Marijuana continues to grow in use and abuse, achieving the “high” label amongst many of the epidemiologists present. The growing number of people who believe it should be legalized, or at least recognized as having medical benefits, continues to push the upward trend. Synthetics: The group either needed more time to investigate or found that synthetics, be it PCP or MDMA, were on the rise. Notice alcohol, not an illicit drug is not on the list. Yet this drug, above all others, is more abused than any other. Note: The circling of some notes in the heroin column are mine, as I attended the conference when it was the main topic of conversation. Otherwise, it is each expert’s notes.